Like many sailors I've become very dependent upon a GPS and electronic charts for navigation. I continue to be concerned about the vulnerabilities of electronic navigation. That is one of the reasons I maintain two independent chart systems (Fugawi and SOB) on my navigation computer in addition to the Raymarine C-120 Multi-Function Display (MFD). 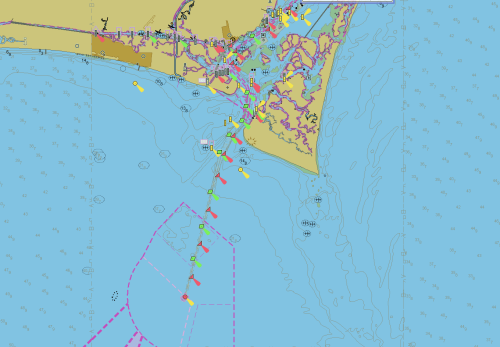 The Raymarine, Fugawi, and SOB chart systems use three different chart products (Navionics, NOAA RNC, and C-Map, respectively). 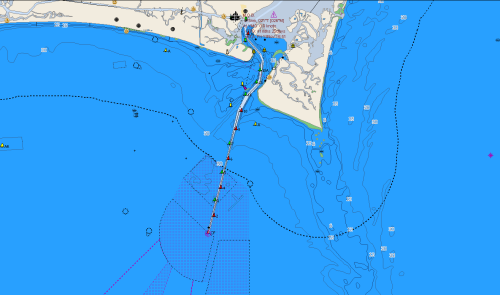 The Navionics and C-Map charts are commercial products, both of which have expensive and cumbersome procedures to keep the charts up-to-date. That is you pretty much have to buy a whole new chart to get the updates. The NOAA RNC charts are free and are updated 2 or 3 times a month and can be downloaded from the NOAA Coast Survey website. Fugawi also works with NOAA ENC (vector) charts, but I find these charts less usefull than the RNC as NOAA has not completely converted the raster charts to vector and I haven't figured out an efficient way to determine which charts have not been converted to ENCs. I have discovered that a lot of the inadequacies of the ENC charts under Fugawi are do to limitations in the software. I took an opportunity in 2009 to evaluate the Coast Explorer and discovered that Fugawi has a comparatively poor implementation of ENCs. Fugawi may have been one of the first to support ENCs, but they've never improved that part of the product. 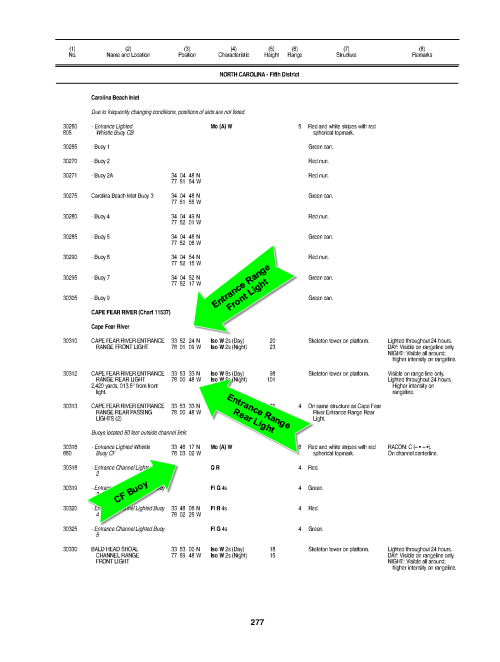 With Coastal Explorer (and I assume other chart plotter products) you do not need to pre-define the ENCs into a loadable chart and CE will quilt the ENCs with RNCs to fill in the gaps. So until Fugawi improves the product I will use it only with RNCs, or more likely drop it in favor of another procuct, such as CE. Before I departed the Chesapeake Bay for the Bahamas in 2008 I updated all of my RNC charts for the voyage. The Navionics charts are the ones I purchased in the fall of 2004 just before heading down the ICW for Florida. The C-Map charts were purchased in the spring of 2007 just before departing Portugal on my return to the USA. I also carry a complete set of paper charts of the U.S. East Coast, purchased in the Fall of 2004 from Bellingham Charts. So I when I departed for the Bahamas in 2008 I had a range of dates for the charts on Sarah from mid 2004 to late 2008. I recognize the need to update my older charts, and I always use the RNC charts to validate a planned course or route. Still it is very easy to fall into the habit of just using the Navionics charts (my oldest) because the C-120 MFD is the most convenient display system to the cockpit. This laziness had never been a problem until November 6, 2008 when Steve Angst and I headed Sarah out the Cape Fear, NC inlet on a planned passage to the Bahamas. The picture on the left is of the Navionics chart displayed by the C-120 (not from the time when we were departing Cape Fear). 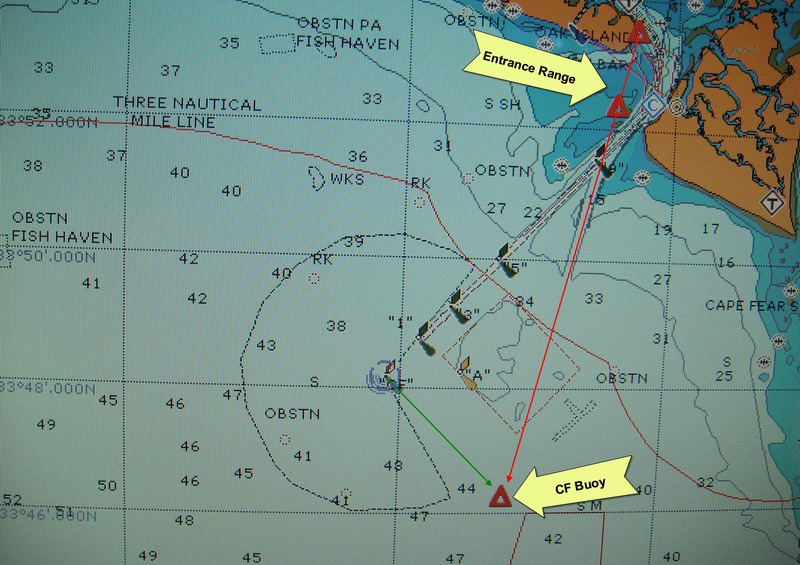 This chart shows a very well marked channel ending with the "CF" sea buoy, from which we would take our departure. As we cleared Bald Island we noted the first can in the series of channel markers was numbered "11", but our Navionics charts said is should be "9". 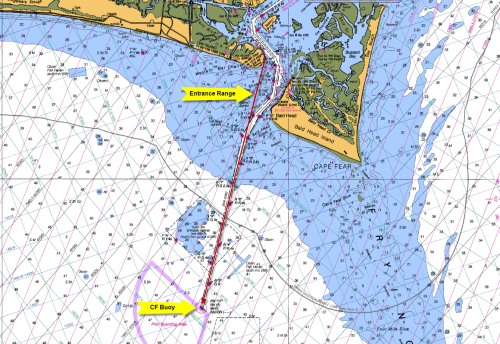 We were using the entrance range and the visible markers to establish our course out of Cape Fear, but I noticed that this was not the course I had plotted to take us to the "CF" buoy and our departure point. Something was screwed up. Since I run Fugawi on my computer at the navigation station I went below and checked our position and course on that system. The buoy numbers on the NOAA RNC chart agreed with what we were seeing on the inlet. 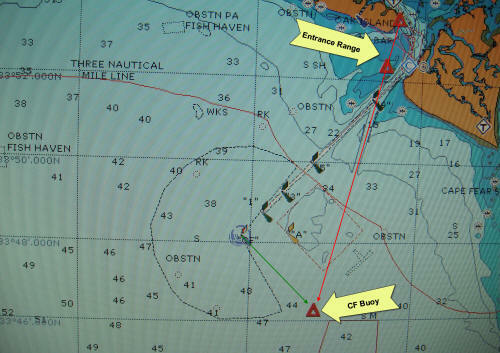 Also the course to the "CF" buoy on the RNC charts matched the course we were steering on the entrance range. It finally dawned on me that either the inlet had been moved and my Navionics charts reflected the old position or the Navionics charts were just flat wrong. This is the same picture of the C-120 Navionics display, but I have overlaid the picture with the entrance range (red arrow) and identified the true position of the "CF" buoy. 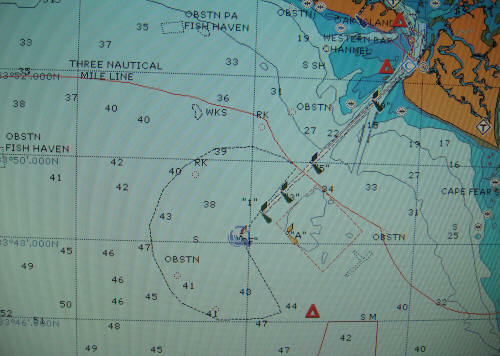 This error was not a major problem for our departure because we could clearly see the channel markers and the range. However, if we were arriving from sea in bad weather we might have had great difficulty correctly aligning our course with the channel. It may have been that the inlet was in the process of being moved when the Navionics charts were issued (May, 2004) for the chart shows the new channel breakwater and the new range lights. 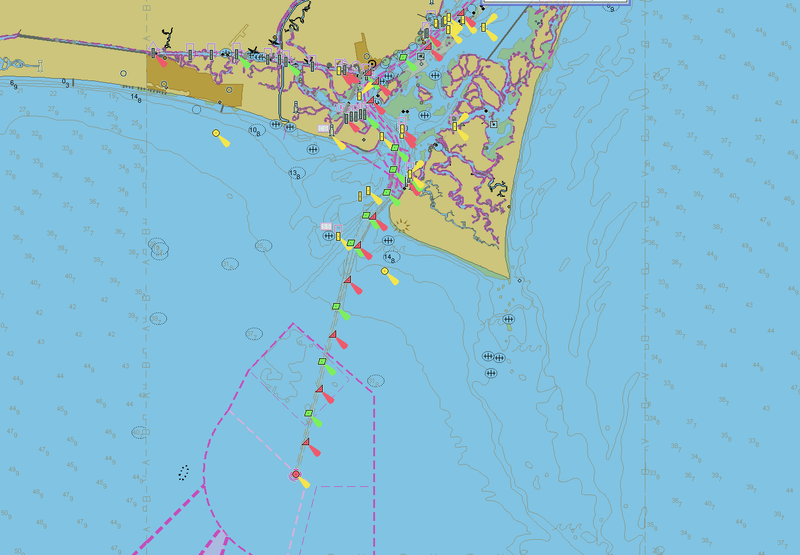 This is the page from USCG List of Lights that covers the Cape Fear Inlet channel. Although I was not using SOB and the C-Map charts at the time, this SOB screen capture of the Cape Fear Inlet shows the correct position and lights for the channel. As would be expected, the NOAA ENC chart of this area is correct and up-to-date. 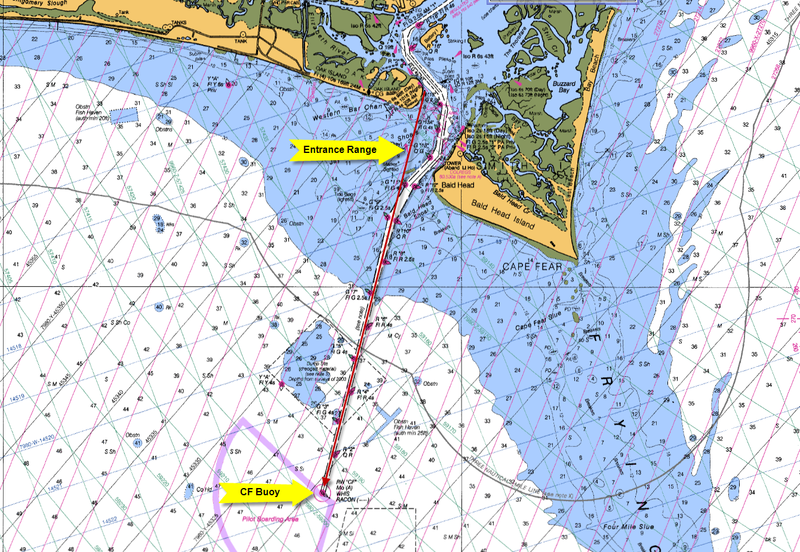 Although this error in the Navionics chart did not create a serious navigational problem for us, it did greatly reduce our confidence in those charts for the remainder of the voyage. This of course was really a good thing, in that we were careful to check the numbers on each buoy when navigating a restricted channel rather than assume a marker was the same as the one on the chart just because it seemed to be in the right position. We found no further discrepancies in the Navionics charts for the remainder of the trip to Melbourne, FL. There were several ICW markers that were different from those on the chart, but they were in the vicinity of inlets that often require markers to be moved or new ones added. Those are areas were you need to navigated by eyeballs rather than charts even if you updated your charts that morning. So now I need to update my Navionics charts, and I should update the C-Map charts as well. Then there are those old paper charts, rolled up, and stored away in the forward cabin.